Kyle and Chris talk about what goes into putting on a live podcast recording - tips, gear advice, and how it feels to record live from a conference. Hear about what Kyle referred to as one of the best podcasting experiences of his whole life. Sorry - no video version today. Chris: Welcome to show me your mic episode number hundred eighteen. The semi-annual I think we’ll call it podcast about fly casting. It’s been that long. But Kyle: your is actually year. Show me Year Mike. Well now that’s is that a Canadian accent? I don’t know. [00:01:00] Chris: sure me your meek. I’m Chris. He’s Kyle and we’re going to talk about podcasting and but the I don’t know what you call but I’ve been in like this. I think I feel like I’m projecting here but you’ve been on like a technologically podcasting slump. I’ve been on like a just a hate podcasting slump where I feel like everything that comes out of my mouth is garbage and don’t like not in a self-deprecating way in like an actual and and usually what I do this. I have my daily podcast where I haven’t recorded in Matthew either have a YouTube podcast. I have recorded a month. Show me a microphone recording month. And this one’s more because of your technological issues of sorts, but usually what I do is just like okay just shut up brain and hit record publish something so I can say it done this time. For some reason. It’s just like. I can’t get I can’t get over that hump for some reason. And so this is like a podcasting therapy. Maybe show me your micro because it’s there isn’t it’s [00:02:00] Purpose Driven, which I is helps. I think when you get trying to get out of a hub is like a podcast like daily a shirt or something where it’s fairly direction is a tough one just to like jump back on the horse with I feel like but how is how’s your how’s your world? Kyle: right, and like you said, I’m pretty technical challenge for right now. I’m on a Wi-Fi network coming from my phone so that you and I don’t have 800 milliseconds of delay between you hearing me and talking back to me. Other than that obviously is wonderful life’s great. And it’s hard sometimes to decide, you know, am I just going to sit down and put in some words here onto the the ye oldie waveform or am I going to like have something meaningful to say I don’t think that this is. We don’t come to this thinking like hey, it’s going to be meaningful. Like we’re we come to this thinking [00:03:00] like it’s gonna be it’s just gonna be us talking about stuff and maybe it’ll the point that it exists is like the as far as I go with expectation on this show the same thing goes for Morning Show and for day for today’s special and things like that. The the other shows I do. It’s just like it exists. And so and that’s good enough for me. Because it’s enough for me to get something out and do it. That kind of gives me that that dopamine kick. It’s a little bit too of like going back and listening to it and making sure that it sounds okay or that the the bit that we did for 12 seconds was funny that that kind of gives me another little little dopamine hit it’s not just the hit the publish button. I think that also comes from the the world that you and I came up and podcasts and is like we were listeners first and foremost and then we were like wait a second. I’ve always wanted to be on the radio. So of course, this is what I want to do and [00:04:00] spend my time with and my money and gear and just talk talk about the art of podcasting or the act of podcasting is the art is that’s definitely a little liberal on the sprinkling of seasoning. Chris: Yeah, and I think that’s where it’s like tough toe. Sometimes tough to keep going when you when the world of podcasting right now is like all these produced and put like heavily scripted and whatever and that’s what you see you. No climbing up the charts and you’re like. The and I kind of Bristol against some of that not because of those aren’t great things. Like they have their own place and purpose certainly but I find myself like on one half of me is like, okay, that’s what I’m doing to do that not because I want to be successful but just because it would be a fun challenge creatively to like do a scripted whatever show or some sort of produced more heavily produced thing. And the other part of me is like screw that this is just for fun. Let’s just have some fun and talk. Yeah. Chris: Speaking of of old days. I this actually brings up the Civil last two episodes. If you’ve been following along with show me my query interview shows with one with run jump stomp a Nintendo podcaster and twitch streamer. And then also with Paulk fastest of Rogue. Amoeba who makes the software actually using audio hijack amongst other things that we use and back in the old days I have noticed now to is it used to be that you could ask one Surefire way to have success in your podcast in terms of download numbers if that’s it. Is having guests on that were have their own audience that are. You’re famous or inFAMOUS or whatever and I think that’s still works to a certain extent in some verticals Industries, whatever but for the in BIO from what I found anyways in seen in a text circles for sure is like there’s an oversaturation now of [00:06:00] podcasters interviewing other podcasters are interviewing people such that like back when we were getting started. Kyle: normal stick. I think was was my draw on it all the time. It’s like oh we wait. They’re not going to play the character that they always play is the crossover episode of SVU and Chicago, whatever series. Where they’re you know, Melissa Hargitay is coming over and you’re like, whoa, this is wild. She still Olivia Benson, but it’s completely different world. Maybe that’s a maybe that’s a little more personal than I expected. Chris: Yeah, now I can identify with the SVU fanfic. I’m not above that these days though. It’s like looking at an episode numbers. I was like, okay, we’ll talk fast. He’s a pretty popular guy. I would think if you’re into like podcasting in there and like [00:07:00] the download numbers. As far as reflecting and he shared it and he did his part. I’m not saying like he was somehow like, you know embarrassed to be on I don’t think but you know and like down the numbers is like nothing higher or lower than what we had before and like I don’t we don’t do it for the numbers per se but here’s it just kind of interesting to me that. It doesn’t even cause a blip in the in the stats these days. Whereas yeah in the past like five years ago or something like that. It’s and it’s so I think it’s combination of like oversaturation. There’s also of them being guests on shows but also obviously way more podcasts that are out there. The show itself is not getting the same download numbers that used to or whatever and I mean doing it semi-regularly annually probably doesn’t help. Kyle: I’m reluctant to be like, well, here’s the reason I’m gonna pull out the map yield map here and point to exactly why that’s the case, but I think the the landscape boy I’m using more map terminology of podcasts right now. [00:08:00] Is such that it’s all about the personality and the regularity of the hosts that are on there and sort of the recurring gags and stick of it. I guess like. As much as you wouldn’t say that New York Times the daily podcast is a stick. It most definitely is it’s every time the dude says his name the way he does. That’s a that’s a stick like you you get tight and you get roped into the way that. In episode flows and that’s what draws you in. It’s not that the topic this week is we’re talking about the Costco’s computer return policy. We’re it’s the fact that I’m the one giving you the news and that’s what you come back for and oh and or the fact that how regular it is it brings to light. Common themes or brings like the [00:09:00] same sort of insightful banter or insightful discussion that it always does. I think that is probably the main reason that either these produced shows for just other shows kind of earned. Their reputation and earned the amount of listeners that they have right now is because of that and not the pick and choose type of interview style. Well, if you bring the Merlin Mann on to your show than the Merlin Mann audience comes with and we’ll stick around at least, you know, 30% of that audience sticks around after the fact. Tends to not work that way anymore or it maybe it does and we just don’t see that because we’ve kind of strayed so far away from from that model. Chris: Yeah, it’s yeah, it’s interesting times. Anyways that way and I think it leads me to like the personality driven service show. So like maybe we should be doing it. Kyle: Yeah. Do you have a longer version of your last name? Maybe that we could throw in there just or you have three names? Chris: like his reactions to like. And then I open the door and look like they leave all the little things it. Kyle: and Yelps maybe yeah. Chris: Yeah, and so for podcast makers I think the danger is obviously to like grab onto whatever the thing might be that you think is their key to success and that’s going to somehow like Caterpillar. Into the top 50 or whatever of shows in like the it’s there’s the personality part. There’s the like what kind of audience did you have before? But yeah, it’s like to grab onto the way that the daily does one guy need to do a daily podcast. That’s going to be the thing that’s going to bring me success or whatever but missing out on the fact that you know, obviously, it’s New York Times They have a few [00:11:00] Avenues to Market that little podcast. Kyle: then they’ve got you know eight different producers all reaching out while that episode is being recorded to get tomorrow’s episode sort of wrapped up and ready to go. Yeah, it’s I was speaking of like the expectation of how a podcast. Is supposed to go even you know expectation for success for you. I lost that a long time ago. I the whole like if you just stick with it, eventually it’ll it’ll work for you is complete BS. That’s absolutely not how it works and I’m tired of folks telling other folks that. You know you show up and you will get success. I think you’ve got to kind of measure the success in your own way. Like I said, mine is just showing up and doing it and putting it out that has been the case for me since forever putting a song that I wrote that I know only two of my friends will here in a [00:12:00] Dropbox folder is success to me like that still feels totally totally worth it and validating. And it’s not going to be the download numbers for me that make me happy. So I feel like the zone of podcasting that I’m in right now is pretty good, except I gotta do it like I gotta like put something out. So if I if I don’t then I’m gonna I’ll start ending up in that kind of like wavering do I even want to do this anymore? Is it actually bringing me? Joy, I’m not sure anymore like it starts to kind of waiver that way. Chris: I’ve stumbled into this fall either because I felt like I was I had some momentum. And then summer end of summer kind of happen. It was just kind of like everything feels old. And so this is the kicking getting back on the horse proverbial horse. But you did something neat speaking of recording and podcasting. Kyle: Yeah, so usually well so I should say the majority of the actual like content and production of the show is on my co-host Tim who is one of the co-founders of untapped and he takes a lot of time to put together a little bit of like. Topical stuff of what’s happening in the beer industry right now and a little bit of sort of like history of a particular style and maybe asking a question about the about the beer industry or about the app in particular and then giving some updates again. It’s like you were saying very [00:14:00] corporate not not corporate. Let me rephrase more like a brand-specific podcast where you’ve got kind of. Hey, we’re here talking about PayPal cuz PayPal’s the company we work for and that’s just going to be it. Maybe we’ll talk a little bit about markets. Or maybe we’ll talk about, you know, people paying each other, but it’s going to be all sort of about PayPal same sort of thing for beer where untapped is the leading be wrap in this industry and it’s pretty fun to put together every single week. I. Out of full disclosure. I used to be the one editing this podcast. We’ve since handed it off to you who are in very capable hands. Thank goodness to put together some semblance of an episode between sort of our on and off banter and you know retakes and things like that. It’s been really good to have. You on the the proverbial team if you would working on that [00:15:00] for us, but so that’s that’s kind of the the rundown of what we usually do on at at this in a little bit of History little bit current events little bit news little bit question and answer and we wanted to bring part of that to the live episode that we had scheduled at Odell’s which is a brewery over in Denver, Colorado. So we were there for the Great American Beer Festival. This is. Big huge like 50,000 person event that happens every single year where you get together in a gigantic conference Hall in the center of Denver you go around drinking one ounce pours of beers that over 800 different breweries brought lots and lots of beer is happening. But we did the we did the podcast at a brewery that was outside of town a little. Which I think was a pretty good place to do it. We have some audio coming out this week actually tomorrow [00:16:00] from the floor and it is loud there. It was just a madhouse and I’ll talk at maybe a little bit about doing. Sort of like live on the fourth floor recordings, but the one that excited me the most was the live podcast recording we did from Odell’s where we sat down with one of their head folks over there and one of the beverage innovators from Buffalo Wild Wings, which was really cool. So again, like talking about guests. It was incredibly cool to be able to talk to those kind of people especially being in the beer industry and sort of. A huge impact that a major franchise like Buffalo Wild Wings has and one of the Premier breweries that are in Colorado to be able to talk to those folks. So it was really really I think an interesting discussion. But I wanted to talk not just about the podcast and the discussion that we had but sort of like the equipment and kind of the [00:17:00] planning that had to go into this and thinking about like, oh man. Okay, so I’m flying out from California. What do I bring? What’s going to be the like most minimal setup that I can bring? We’ve got enough microphones for both Tim and I the to co-hosts and then the three different guests that we were going to put on it was kind of a logistical nightmare trying to figure out like hey do I have a cable is might have another cable. I had to look everywhere to find a bunch of XLR cables. Kyle: Hi, I’m Kyle and Taps now. Actually, I’ve changed my name we were talking about. Hi, Mom. I’m Michael borrow untapped. It’s a hyphenated situation. [00:18:00] Kyle: Yeah, yeah, most definitely and I it’s hard to my wife says the same thing so I can’t I can’t fault you for believing that she hates hates my morning show Kyle Morning Show persona. For sure. Yeah. She’s like, oh, it’s so fake. Why are you so fat? Like well, it’s it’s an inflection. You know, it’s like you got to give the people what they want. So we could have rented stuff. There is a local place called borrow lenses that does both audio video photo gear and they’ve got some local places, but you can also have the the stuff kind of mailed out to you and they’ll rent it for you know. Three days seven days 10 days. We brought I’ve got one here. I’ve got a Shure sm7b that I’ve been using for the last like five years of podcasting that I love very much but is incredibly grotesque and disgusting and made sure to not give the guests. I would I probably would have done pretty well [00:19:00] grabbing like a new cover for this. But then we have two others to other sm7 bees that are in the studio in Downtown LA. So we had a total of three of those microphones. We also I have a Shure sm57 which is like one of those kind of regular looking stick microphones the kind that you would see like Bono singing to write you and I am I speaking your language now. He probably doesn’t use it. Sure sm57 but either way, it’s just one of those kind of like $200 Dynamic hyper-cardioid style microphones that you might you may even see folks like. Pointing it at a cabinet to record it in studio for guitar tone and things like that just to kind of get more of a studio sound and less of a [00:20:00] computer. I found it. It’s pretty warm in terms of sound so I brought one of those as well and we have them all feeding into a zoom H6. This is one of those like. Battery powered portable recorders you slam of SD card into it and you can record up to this one was six tracks. It’s for XLR inputs and I believe like a some sort of the to other inputs other places. Maybe maybe they consider like the little microphone that connects to the top to be the other two tracks. Kyle: Got it that makes out you sound like you’ve done your research, you know, you know what you’re talking Chris: I have one of those that I use. Yeah, I or I’m supposed to be using as a backup for any time. I do a podcast recording it’s conveniently sitting in my backpack across the room. I can see it over there not being used as a backup for this recording. Kyle: is he as he goes and checks on his audio hijacking out there were still going. Yeah, and [00:21:00] I looks good. I really liked it. This was my first experience with the h66 track in particular. I had used a. I feel like it was assumed H1, or it was one of the first ones that I had ever. Come across with zoom and that was one of the first devices that I recorded voice over for for like videos when I was working at Mophie the battery case company. We I was doing most of the voiceover for both like our call center that we had in, Michigan. And also the videos that we would put out it was a lot of voice over for that. So I was using the the zoom H1 for those purposes, but I hadn’t used it sense. So like getting up to speed with the H6 was pretty easy kind of the same controls on that one. But one of the coolest Parts about it was that it had built in. Limiters on each of the different inputs. So I would plug the XLR [00:22:00] into a Fed head which is like an inline microphone preamp where if you pass phantom power to it, it’ll kind of lower the noise ceiling. Is that what it’s called. Anyway, it made it so you get more gain. Yeah, the the yeah the noise floor was lower so that way I was able to kind of. Pulled down the game knobs a little bit and make it so it wasn’t, you know, really really cranked up and grabbing a whole bunch of noise. That worked really. Well, I liked the the FED heads kind of plugged into those and then I would turn on the limiter on each of the different tracks and that way I wasn’t adding like inline compression and there wasn’t any weird delay because of the software compression coming out to the monitor for the headphones. It was just a very very good experience and like looking at the Monstrous Beast of a like [00:23:00] rack-mounted system that I had prior to doing this or even that we have over in the. Downtown LA Studios. It is just a godsend to have this Zoom H6 recorder just be this tiny little thing that I put in a little bag and carried around the show floor with me. Chris: Well, it’s it actually functions on its own. It could be like a replacement for my like I have a focus rate box. It actually works as a with the USB cable as a what’s preamp, I guess or mixture of. I’ve never tried that myself, but it was kind of like thing that I [00:24:00] bought two as a I would use say output from my focus right into that as a just hit record on it. So it’s independent from a computer. I guess the idea being right if audio hijack or whatever dies then I’d still have recording but chances are like if my computer dies Skype or whatever word like in this case we’re talking Discord. He would die as well. And so why do I need to save really because the conversations done but yeah rather than relying on your everything all in one spot. Kyle: I guess you could also sort of like take the whatever the headphone jack of your Mac if you wanted to and just Jam that into into the recorder and have it just sort of be like here’s a flat, you know, one track version of everything that Chris and I did. During that day just as I’d sort of backup of a backup. Chris: That’s how I justified by it. And then I’ve used it a few times eight [00:25:00] is great. I like the live or like remote situations for sure where you need to record a bright when we travel to like Mexico and and Montreal we went to once and record a podcast with my wife there. Kyle: so I plugged in the sm57 which is like that that stick microphone. I threw a mic flag on there which made us look super legitimate. I was so surprised at at how like, let’s see. I just put I put it in the show notes, but it’s a likes. Little mic flag that goes kind of around your stick microphone. It is a seven dollar and fifty cent piece of equipment that just goes around your microphone and I put a bunch of stickers on to it and it made us look like a radio station. [00:26:00] I highly recommend if you do anything with that you where you’re supposed to be like quote-unquote media for things that instantly added a touch of like we know what we’re talking about to folks as we were saying like hey, do you want to be interviewed for a podcast that we do you would see the mic flag and they will say hmm. Okay seems legit. Like as much as much as our questions may not make us seem legit that definitely did that added a a bit for us. Chris: Probably similar to like if you I’m guessing you had like untapped shirts onto or whatever just like stuff that is really actually when you really think about it is super easy to be in prep for something like that to have like you can go to a teacher storing at a custom shirt for 25 bucks with your podcast logo on it. Kyle: But it was kind of you know out of common courtesy you want to walk up and [00:27:00] say, you know Haywood, who are you and who are you with and would you like to speak on a microphone for a podcast that we are recording it, you know kind of lead in that way. Don’t just be like hey, I’m here. We’re talking to this person who’s pouring. How’s it going? They you need to kind of introduce the the ID and get sort of consent from them to be able to record. Chris: kind of stuff definitely helps your own confidence in doing I think that’s the biggest part of it is that idea of like just faking it till you make it kind of idea of like hi. Kyle: Well, that’s I mean, that’s definitely what this live show made me feel like oh boy, like this is things got real real quick, you know meeting meeting folks and setting up for this show was kind of hectic. So. Because I had three [00:28:00] sm7b s and one sm57 that’s for we have five people that needed to be on the podcast. So already the maths off. We only had also four channels and five people needed to be on the podcast. So the way the way that we got around this was assigned one. Sm7b which is one of the ones that I’m talking on right now, I sign those two people but cranked the gained quite a bit to be able to get their their voice both at the same time and you know while it’s coming to to us from the side here or straight ahead or you know back a couple feet it needed to sort of sound the same. And that’s where these fed heads really added a lot of room for me to be able to pull up and down the gain while the episode is being recorded so that it got as [00:29:00] much gain is a needed to to have the person talk while or hear the person talking while they were talking and then pull the game down when they weren’t talking so that it wouldn’t get any kind of like mouth noises or you know, beer-drinking slurps and things like that. Kyle: Yeah, I was tired. I should probably shouldn’t have been doing this but I was dialing up and down the gain knobs to kind of a. For any changes in like of the guest kind of turns to the person next to them wants to talk about something. I would kind of slowly pull gain up a little bit so that it would get what they were saying at a common volume. Chris: Which that’s where the both the editor if the editor isn’t the same person as the recording person in the room, you have to have a certain amount of trust that [00:30:00] because either is on the editing side I can speak to that side is like either you trust the person is going to do that. Through the whole show or you’re in a whole world of pain because if they just do it for part of it, then you kind of have to like really make sure you’re paying attention obviously to the audio levels on every track at all times because if Kyle forgets to turn someone down one time, obviously that is going to like maybe blast through or they’re not loud enough because you forgot to turn it back up or whatever the case may be. And so yeah, we’re we’re in the end it worked fine obviously and it’s great to have that option so that you’re not getting because otherwise you’re dealing with obviously. Room noise on every track that is mixed does make it harder to cut and edit and chop up what might be like a boring section of the conversation or whatever if there’s like, you know got glasses clinking in the background that all of a sudden cut off because you cut the audio and don’t know of Crossfade or something the background noises. Kyle: bit of echo, but this was I mean most definitely especially at the beginning of the show. We have the weapons. Is open and it was it was just a like free-for-all in terms of sound and and Ambience and everything. I like you were saying I had to make sure that during the entire show. I was the only one monitoring as well. So that’s that’s I think something kind of imperative to mention for especially the zoom H6. Is that there’s only one output for headphones. So if you’re planning on having multiple people hear themselves while they’re recording you’re going to need some sort of problem not a splitter, but not like a cable splitter. You’ll need an actual headphone amplifier. Yeah to be able to plug those. But you got to think too if it’s folks who have never really been on a podcast before but they’ve done maybe radio interviews or they’ve done other interviews with other people for newspaper or for [00:32:00] eater.com or things like that. They’re used to talking about their stuff, but they’re not used to hearing themselves. And so that can kind of throw off the Rhythm. Of whatever the conversation is. So that’s why I was the only one monitoring stuff and kind of like we were mentioning before dialing up and down the game as the episode was going on trying to attenuate for you know, what these these different intonations and things like that of people laughing and talking and kind of turning their head to the side and things like that. Kyle: know so that was that’s one thing. I think that I would definitely want to improve on for next time. If we ever did this again is like bring both my own PA system and bring a system for other folks to hear us whether that’s a tiny little speaker or whatever. The room was dead silent the whole time which I’ve got to thank our [00:33:00] listeners and the folks who showed up for that recording because they were trying to just hear the conversation because it’s like, you know, five people talking in a bar you are taking silent sips of your beer trying to just hear any any small little word from all the way across the room that I would definitely want to change in the future any live podcast recording you go. You kind of expect to be able to hear them. You don’t want to have to come up to them later and be like, hey guys, I could hear you part of the time, but I was mainly just talked to my friend over here and I’ll catch the podcast later. Like that’s not the point of showing up to live podcast recording. So again like that, that’s something I want to improve. Chris: Yeah, I was in a I did a presentation was so it wasn’t a conversation or like a plug multiple people talking where I had to be Amplified but it was you know, like a pub and they had our special room for presentations and stuff like that and probably for like parties or whatever and they had actually speakers around the room in like some of the booths and stuff and so like the mic [00:34:00] Audio Level was fine. And then they actually had little screens like a you know, a PowerPoint or keynote or whatever screen sort of scattered throughout the the pub to account for the fact that there’s like a low-hanging ceilings often you an older pubs or whatever and. And you can’t there isn’t good line of sight. But yeah adding the the fact if you want to record yourself as well as have the room here, you just actually it’s funny how something so simple as that UPS the complexity especially if you’re not just going to have you know, like camera guy or whatever person sitting out in the audience recording you. But you actually want like microphone in your hand or in people’s hands or in front of their faces recording them doing live to the room and to taper or digital memory card. I guess recordings just it up the complexity and there’s a lot of like like you said like a bit of planning ahead of time that can really save you a whole lot of headache and just having audio extra audio cables around make sure you have mics for Buddy Mike stands. Kyle: you’re saying like knowing the space and knowing like well the ceilings kind of low here. So it’s probably good maybe if I just print out the [00:35:00] slide deck and give it to people or you know, something something that kind of deals with the way that the space is so that it’s not a struggle for people to be there or they don’t ever want to come back to. Quote unquote podcast recording I don’t want to have ruined the experience for you know, someone who’s a local. He’s like, oh man, they’re doing another podcast that Odell’s never mind. I’m not going back. Chris: In terms of the venue itself just for folks who are thinking of ever doing I have often thought it’d be fun to do a live recording of obviously whatever like a show and and I’m sort of done smaller versions of that inside other venues. But like if you’re approaching a venue in this case, maybe you guys had a relationship with the pub already through work or whatever. But like is there any tips in terms of organizing and arranging things ahead of time that maybe you were helped? Kyle: I would say the timing and scheduling was probably the number one thing that I would focus on obviously you need to build a relationship. Whoever it is to be like hey, I’d like to do this [00:36:00] or at least approach them. Don’t just show up with your you know equipment and be like, yeah, I don’t know we’re going to set up over here in the corner at least approach them and ask and make sure that it’s okay to bring that type of stuff in. Because it is their establishment and obviously the you know, they’ve they’ve got other guests to to deal with as well. So you don’t want to disturb those folks. But other than that getting into the venue an hour ahead of time to be able to set up before the pub was even open was absolutely necessary. We use that full time to move some stuff around set up the microphones use Gaffers tape to kind of pulled stuff down and make sure that. The cables and stuff aren’t going to go everywhere make it look kind of presentable to it’s not just you you went into. Apartment threw down all your stuff and not the backpacks over here. And the microphone is half hanging off over there and things like that. I wanted to look, you know somewhat decent and [00:37:00] there are photos online and it still doesn’t look that great. But it’s it was good enough to kind of get the recording. So being able to get there an hour early and set up was instrumental to making that. Start on time. We had a like noon start time and we went until to so also allow yourself plenty of time afterwards to break stuff down and put it back because actually setting it up was a lot faster than tearing it down was because you want to make sure that it’s, you know nicely put together and you’re able to carry. The remainder of your stuff either back to your house or to your hotel room or whatever. Yeah, that’s a’ight. I’m honestly like the production of the show was pretty pretty much what we expected the folks who turned out was I don’t want to say that we like expected folks to but we set up an event bright so we kind of had an idea. Of who was going to go you had to RSVP to the [00:38:00] event and we had a certain number of kind of seats or area that we could fill up on the second story of this of this Brewery. So we wanted to make sure that that you know, folks are going to be there which 10 which worked out for us. But time man time was definitely the number one thing that I would say to focus on for that kind of thing. Kyle: The other the other thing that we wanted to do was we wanted this to be sort of our debut on Instagram live, which is there sort [00:39:00] of live streaming service. And we the day of we ran into some really weird issues with the difference between. Android Instagram and iOS Instagram and even in even just different applications. So I bought this little like TRS to trrs patch cable, which is basically a 3 loaded. What is it like a stereo prong eighth inch to a iPhone style? Prong where it’s got the three little lines on it and it separates out the channels and the microphone and it comes in just as a microphone into a phone those the whole point of getting this road cable. It’ll be in the show notes, but that was instrumental if I can it says musical instruments here. So I’m just thinking instrumental to our being able to record the backup of the whole event and everything into. Oh my gosh, I’ll [00:40:00] phonic on my Android device. That was a lifesaver just in case something happened like we ran out of batteries or something on the zoom H6. I have that sort of as the the back up just a flat one one track thing going into my phone. But what I wanted to do was use @trs patch cable to go into an iPhone and iPhone 6 Plus. Where it still has the headphone jack and pull that into Instagram and be able to just record live, but for some reason it doesn’t support external microphones. So if you’re ever intending to do that. You may have to use some third party or something on top of it kind of like what we had been trying it at good stuff for periscope the I was surprised we found that out day of like hey, this doesn’t work. Kyle: clients on both platforms didn’t work for us, but it would work on like recording a video in one of these other applications on iOS would work or recording with auphonic on my Android device totally worked. So I’m not sure what the what the case was with those. Chris: I think it’s an Instagram thing because I know like Periscope and your guy you guys probably your brand or whatever and you’re following is most prevalent probably on pair are on Instagram. And so but I’m I’m pretty sure I know I’ve tested the past anyways Instagram or Periscope, sorry will support an external mic on iOS anyways, and so it probably is just that a platform level that they haven’t. Seem demand or request enough request for it or whatever to add support. I’m sure it’s got to be baked into the operating system level thing at this point. Kyle: Yeah, it’s I just I read way too many forms and things like that. Try to figure it out day of so definitely like. Yeah, like you’re saying figure that kind of thing out anything like live or if you need to call someone on Skype like make sure you get your get their Skype name before before you go to like. Oh, yeah, I gotta call him. Whoops. Chris: Any other questions in terms of like the recording that you like the you would do different like you you recorded on the zoom H6. So that gives you multiple tracks obviously and so then you’re sending either yourself or in this case. You sent it off to me and multiple tracks makes a nice to like separate things out when somebody’s coughing Etc levels adjusting all that kind of stuff. Kyle: Monitor. Just monitor everything you do like whether it’s you as the interviewee or the person who is taking video of you, you know, giving an interview or whatever the case is. This can one be easily done with just one person that that I believe for sure. [00:43:00] Thankfully I had Tim there as well and I was sort of like doing the the Nightly News sort of like hey, let’s go to this person over here and interview them as I had this weird. Look of I got my headphones on I’m monitoring them and I’m also pointing the microphone at people and having them. But that was the absolute way to do it. I needed to be able to hear them and know what their level was without looking at the zoom H6. The whole time like are the levels. Okay, are they clipping the difference between working the floor and doing the live episode where I was like cranking the knobs back and forth was when we were on the floor. I left it the same volume the whole time. I didn’t want to or the same game the whole time. I didn’t want to touch that. I didn’t want to mess anything up. With like my how far I was putting it away from people’s faces or you know, things like that. I wanted to try and keep that audio as consistent as I could. So that it wasn’t broken up [00:44:00] into a bunch of different files and all that kind of stuff. I thought it would make your job a little bit easier. Hopefully well, we’ll see we’ve got that episode coming out tomorrow and then Chris. I’ve got a whole bunch of other audio coming your way very soon. Kyle: When the invoice gets paid the podcast editor will play I guess I really I have said this internally at in our company, but this was like one of the best podcasting experiences of my whole life. Being able to go around and talk to people with a microphone and get recognized and say like hey, are you guys on the untapped podcast was wild it was like a minor Celebrity Status at at [00:45:00] this festival and I could not believe it. It’s it was incredibly humbling, but it was also really cool to like be only focused on the gear side of the whole live recording experience and be like, you know, Don’t worry. Chris: And that’s where it like trying to wear multiple hats in a live recording. I think it’s best if you can find someone either like you have a co-host so that who’s less gear focused and it’s more like guiding the conversation focused which kind of seemed like what team was doing for you in this case or like at least having a buddy who just comes and run some audio for you. For that, you know live recording so you’re not having to like guide a conversation keep everybody on tack on track and also manage your audio gear and make sure that the audience is happy and makes you know Outsource some of that stuff have you can for the live recordings? If you’re if you’re a Solo solo podcaster of [00:46:00] sorts So speaking of solo the there’s I we have reference it a few times and then passed out but I don’t think I mentioned in the paint in the interview episodes, but the I’m still. Sure, sorting out trying to how to build a community of podcasters. And so there’s a sign-up form for like it just a MailChimp landing page. If you want to be on the newsletter. I’m going to send something out your this week or next week depend on how how much I get done and just sort of announcing some next steps in that anyways that journey and and I want to be I’m trying to be a little more intentional than just like what I would do in the past is. Kyle: You have to externalize like your desires for what you’re trying to [00:47:00] grasp at with people and that process is that makes you not want to do it. Honestly like that makes me like, oh no, I have to tell you why I want to do this and are you kidding? No way. Chris: No, no, I know what you meant. I know there’s folks who have signed up to be interview or guests on the show in a future episode. And that’s one of those getting back on the horse things saddling up. I don’t know whatever the analogy is, but just need to start doing any because I got into a really good rhythm of it on the show me your mic in the past and and it’s a lot of fun talking to. Just kind of like you’re all out there. There’s another six or seven of you on the list right [00:48:00] now. And and I really appreciate you putting your name down and being willing just even to submit your name and your podcast to be a part of this thing. And it’s this is one of those cases where it is. Definitely not you it’s me in terms of just the getting over the nerves the technical issues ETC to like connect all the dots together to make that happen again, so don’t fear that it’s it hasn’t gone wasted or gone into The Ether ice. I do have still have the. Red sheet and there’s a link in the show notes. If you want to also put your name on the list of folks you’d like to be interviewed on a future episode. 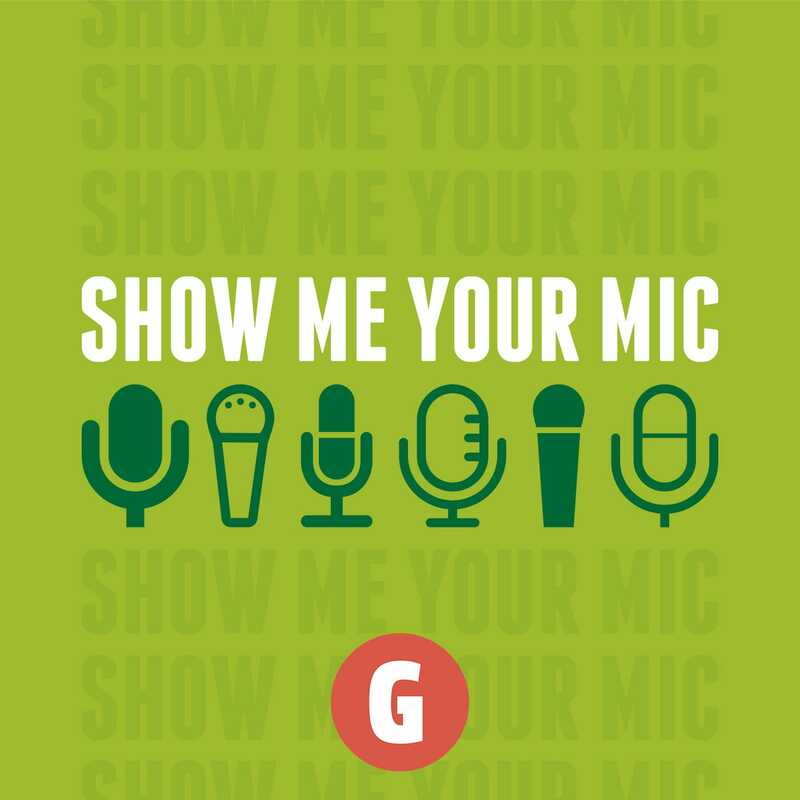 Show me your mic good stuff that I fam SM a.m. ask is where you can see how you can submit questions for the show for a future episode where we’ll hopefully I think that I’m assuming that the. If this then that thing is still grabbing stuff from Twitter, but maybe that’s why there’s no questions in there because the boss stopped working. I didn’t get a note of it. Yeah. I got the notification when Facebook got hacked here that all my Facebook connections broke. So I’m assuming it’s letting me know if it’s broken. I was actually one thing I want to ask you because I was thinking I’ve been wanting to I’m going to be starting a podcast for my business just a little bit about podcasting but the decision to use a. What’s the word subdomain I guess podcast on untappd instead of like building it out as part of your actual website, I guess in your case. You have an app at on tap.com like the social network. And so then it probably is a little more complicated than like folks who maybe have like, I have a WordPress install it. I’m a Productions at CAA. So putting I’ve been toying with doing like podcast.com reductions ICA or you know in any regrets and doing it as a subdomain or anything that’s made it easier or better. It’s as doing a sub domain. Kyle: the technical side. No, [00:50:00] I don’t think so. We run ours on simple cast and it’s simple like redirection I guess of yeah. Yeah exactly where your where we can still assign like podcast.com slash 31 I think is what the next episode is going to end up being but. Yeah, I think so far. It’s worked out pretty well. I don’t have any issues with it. Most of our website though. Like you said is after the.com. So we’ve got on tap.com slash user slash Kyle Roderick or something like that. Like that’s that’s our typical URL scheme for the content that is on our beer database. So to separate it out. Good, like you would kind of guess what like blog posts and stuff like that. You know, that might come after the dot see a slash. So putting it ahead of the loan Productions might be in your best interest. So you don’t confuse it with like, you know dot see a slash [00:51:00] 2018 9 12 this is a podcast episode, you know type URL. Chris: Yeah, and it used to be like I know people were really concerned about subdomains with SEO value and I think these days it’s just like every I don’t know where you guys see for traffic but it’s so much of it is shared and not people just like it’s not like they’re Googling and finding your up so that although I guess we know having beer referenced and stuff and certain brands and maybe different places pubs and stuff that you reference a don’t otherwise have a lot of like web site presents. Chris: job cheers. Cheers to your SEO. All right. Thanks. Kyle. Your your hop burps now. Kyle: you [00:52:00] can find me at cold pizza Dot online. Kyle: is this is an experiment that I’m running right now for you can see even like my about page is jacked up right now, but this is an experiment I’m running for like hey social networks are bad except for aunt. So I’m leaving them to sort of fester and be wounds of my past. So here I am over at cold pizza. Online. Where are you on the. Chris: I am at 11:00 Productions ICA. Is that where you can go to hire me? I just actually read rejiggered. I hate saying redesign. I just kind of move some content around inside of Wordpress theme. So it’s this is why I refocus my website around podcast editing and Consulting as opposed to building websites for folks because I was never really. Of course designer, I guess I wasn’t are course designer. I wasn’t a [00:53:00] real date with websites and not that I don’t help clients still with some of their Web projects, but just wanted to be like, hey, I love doing the podcasting thing. So let’s just go all in with the business side of it too. So I’m reductions RCA’s. You can check that out. And then I my croissant Witter still I haven’t yet pulled the plug on on my social media, even though I talk about it. Probably more not more than I should for wanting to. Get rid of that some anyways, you can find this episode of good stuff that if m s m ym 1 1 8 and find the rest of us wherever you find Us online on the podcast stores of your choice. The Apple One the Google one the Spotify actually announced the submissions for their own. Podcasters at Spotify.com beta sites where you can submit your podcast to be on so be sure and do that if you’re so inclined. It looks like I read through the terms of service looks like there they play nice with your content and leave it intact. So I think and the definitely is yours still even when you submit it. So there’s no sort of weird takeover of your audio and stuff. So that’s good [00:54:00] and now let us know. So the questions comments to hashtag ask s mym or @s M. Ym underscore FM on Twitter. Thank you for listening. We have a good day.